This year I visited Shanghai in order to visit my wife’s cousin. While there I also had the opportunity to visit a classmate of mine, who is married to one of the most interesting men I have ever met. This man is a personality psychologist who is in private practice, consulting with large corporations. 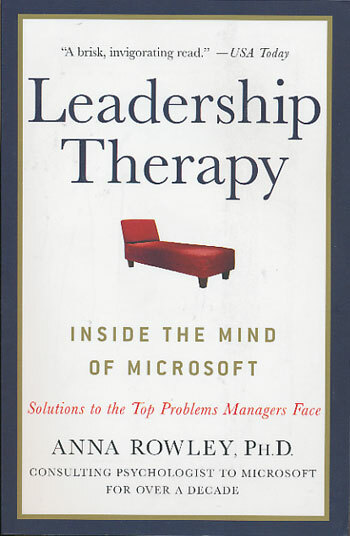 We talked about our lives, and he suggested that I read Leadership Therapy: Inside the Mind of Microsoft, a review copy of which he was recently given. My take on Leadership Therapy is generally negative. But the Amazon.com page shows only five-star reviews. Therefore, while my review is negative, others have clearly found something in the book. My biggest gripe about Leadership Therapy is that it strikes me as a rip-off of Jim Collins From Good to Great. I had the definite feeling that Rowley was using the angle of psychowhatever (she claims to follow the pseudoscience of psychotherapy in addition to the science of psychology) to simply transliterate Collins’ business book into therapeutic terms. If you want to read some great self-help books, check out From Good to Great or Linchpin, or listen to the Dave Ramsey Show. If you want to read about Microsoft, The Microsoft Way and I Sing The Body Electronic both provide astonishingly intimate perspectives. I rate Leadership Therapy 2 stars out of 5. That is, not much serious research on one is done through the other. But it’s fun to think about. Zenpundit links to a piece on Whirled View about nuclear disarmament. Cheryl’s reference to “evolutionary psychology” is a misdirection, but an accidental and understandable one. “Evolutionary Psychology” is a small, marginal, not particularly useful, if incredibly interesting take on the intersection of human evolution and human psychology. A far more useful field is “behavioral genetics.” The current media-friendly discussion on “human nature” comes from “behavioral economics.” And of course, there is a whole lot of work on cognition that does not necessarily invoke evolution at all. With respect to nuclear arms, international relations, and human nature is this: people predictably make irrational decisions that can only leave themselves worse off. Here is a Scientific American piece on bubbles and a post over at gnxp about neurotypicals. Part of human nature is the ability to evaluate our situation and to change our behavior…. So we should be able to consider, and work toward, outlawing nuclear weapons. Makes almost no sense. Of course we are able to evaluate our situation and change our behavior. Indeed, those systems that allow people to do this most often can lead to catastrophe more often, because of the lack of a governing infrastructure (such as a Military-Industrial Complex) that prohibits bad outcomes. People rarely understand the consequences of their behavior. Feel-good liberals in the Obama administration, in an attempt to protect science, censor science (Half Sigma, Slashdot). The same thing happened under Bush and Clinton. Similar politically correct idiocy controls every area of human endeavor that has not been automated into mindlessness. This is a consequence of our human nature — we are irrational, prejudicial creatures with limited attention and even worse facility for logical thought. Smart people regularly say dumb and stupid things, not because they are bad, or even stupid by human standards, but because they are human. Smart people regularly do stupid things too, as history has shown. The real discussion on nuclear weapons should not be conducted in the optimistic tones of Cheryl’s post. Rather, the appropriate question is this: Given that the world’s military forces will be under the control of humans in the near-to-mid term, should those military forces also include nuclear weapons? And in that discussion, breazzy assurances that we can evaluation our surroundings are so can outlaw nuclear weapons have no place. Pretty obvious. Wise educators should align extrinsic and intrinsic rewards, at least when dealing with children who are not able to make the decision to learn by themselves. Creative bloggers need to not only master their craft and gain the attention of their peers: first, they need to keep trying, in spite of many failed attempts at meaningful attention. Both of these stories are courtesy of Slashdot: News for Nerds. Attending AERA. Â Interesting combination of research, methodology, networking, and political activisim. Chicago Boyz had an interesting thread comparing the self-esteem movement to China’s focus on engineering education. I suspect this is becasue of the influence of the regular education faculty, who have limited training in the theory and methods of psychology, but a lot of exposure to educational fads like emotional intelligence. To complicated matters, there is a predctively valid concept caled “sellf-efficacy,” which unfortunately shares the same initials as self-efficayc. On a scale of 0 to 100, how confident are you that you can perform the following tasks? No one takes self-esteem seriously. Criticizing it is like criticizing holocaust denial: an excersize in frustration. Self-efficacy is one of the best motivational constructs we have. Update: Using the terms ‘entitlement’ (think: ‘self esteem’) and ‘locus of control’ (think: ‘self efficacy’) the New York Times covers similar ground. There is an interesting post titled “How the SUV User Experience Trashed Detroit” that talks about our friends in Detroit some. What I find interesting is not so much its attack on SUVs, as its division of “User Experience” into First-, Early-, and Deep user experience. When we speak of the â€œuser experienceâ€ and how it impacts purchase and adoption of products and services we divide the framework into three basic pieces: 1) the FUE or the first user experience, 2) the EUE early user experience and 3) the DUE the deep user experience. We know from extensive research for leading high technology and media companies that there is no EUE or DUE without a very compelling FUEâ€¦in other words, what the customer first experiences is all important and in fact my be uniquely critical to the success of products which in the end, like the SUV, are of marginal or even negative relative value in the larger context. If you get the FUE right you can sell almost anything and customers will thank you for it. When we employ more advanced psychometric testing methods to user experience design research problems this effect surfaces in web sites, cell phones, video games, automobiles and a wide range of other high tech products and services. It appears that the First/Early/Deep division of user experience is a way of describing the learning curve (becoming more proficient with the tool over time) and the affective curve (becoming less “wowed” and more comforted with the tool over time). 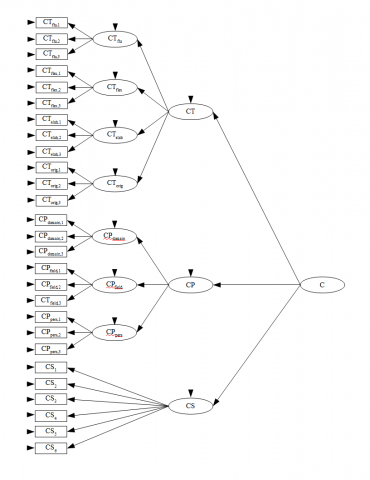 I don’t know if we need to split user experience into three separate sections, except for ease of memory (think back to when some folks took the idea of 4GW as a dialectically distinct gradient of war, for instance), but the idea of user experience naturally changing over time is an important one. Tools that market themselves should have both a steep learning curve and an affective hook that gives people patience to learn how to use them.